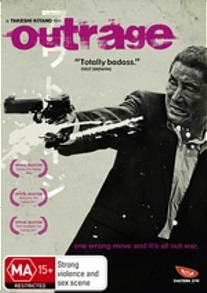 Outrage DVD Review A relentless tour de force of unrestrained aggression, Outrage plays like a cross between The Godfather and Reservoir Dogs done, of course, through Kitano’s inimitable filter. After completing an almost universally ignored ‘surrealist autobiographical’ trilogy over the past five years, Japanese director Takeshi Kitano has thankfully come to his senses and gone back to basics with Outrage, his long-awaited return to the gangster genre. Recalling the best of similarly-themed Takeshi outings like Sonatine and Boiling Point, Outrage is a little slicker and a little more straightforward, but certainly no less enjoyable then the films that made his name. The simple story revolves around several warring yakuza gangs: when the head of a massive organised crime syndicate decides one particular gang, the Murase, needs to be pulled into line, all hell breaks loose. As the bodies pile up no one, it seems, can be trusted, and when the same boss decides the Ikemoto gang’s power base could also do with a reshuffle things certainly don’t get any more peaceful. A relentless tour de force of unrestrained aggression, Outrage plays like a cross between The Godfather and Reservoir Dogs done, of course, through Kitano’s inimitable filter. It’s a stylish, engrossing and occasionally gruesome examination of life on the other side of the law, and one hell of a return to form. Takeshi takes a macabre glee in thinking of a variety of inventive ends for his villains, and some of the methods of dispatch have to be seen to be believed - one particularly bloody scene involving a dentist’s drill springs to mind, as does another involving a pair of chopsticks. The only real negative is that, as kill follows kill, so too is any chance of the audience really connecting with certain characters dissipated. Even Kitano (credited, as ever, as ‘Beat Takeshi’) can’t muster up much sympathy as the old-school Ikemoto boss trying to save his own skin. But with a film this good looking, not to mention entertaining, few are likely to be complaining. A 20-minute Making Of featurette, and several trailers.